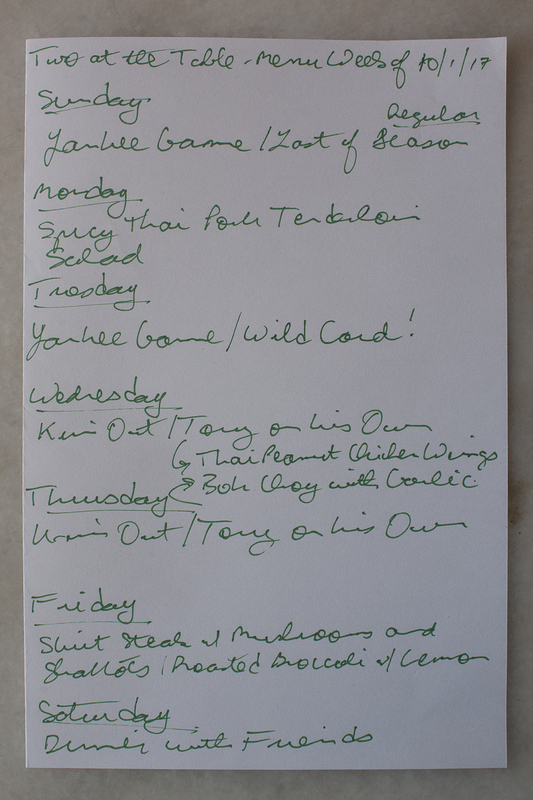 It’s another busy week for Two at the Table, with the Yankee game on Sunday, an alumni event on Wednesday, a photography lecture on Thursday, and a special dinner on Friday, but as always, we’re going to try to make a few new dishes to keep things interesting. We’ll start the week by making Fine Cooking’s Skirt Steak with Mushrooms and Shallots and Roasted Broccoli with Lemon on Monday. We had planned to have list last week on Friday, but received some fantastic news that was cause for a celebratory dinner out: Kim had been named one of the New York Junior League’s 2018 Outstanding Volunteers! On Tuesday, we’ll make a dish that should leave us with enough leftovers for dinner on Thursday as well: The New York Times’ Chicken in Mustard Sauce. This simple meal, which came to The Times from famed French chef Jacques Pépin, involves making a mustard and onion sauce in the same pan in which you cook the chicken, which will certainly save clean up time. We’ll end the week with a batch of vegetarian chili. We’ll make Ellie Krieger’s Vegetarian Black Bean Chili with Ancho and Orange. We don’t remember if we’ve made this before–it may be one of this dishes we planned to make but just didn’t get to–but we’re excited to make it either way. Our special dinner on Friday night will be…Oktoberfest! We’re continuing our tradition, which extends all the way back to at least 2014, the year we started our blog, of making a Oktoberfest-inspired dinner and pairing it up with several different Oktoberfest beers. As in past years, we’ll have friends over to join in the fun. We’re finalizing the menu, but Alton Brown’s Homemade Soft Pretzels will most definitely be on it. We’ll likely have a pork dish for our main course and an apple dessert, but we’re still figuring out all the details. Check in later this week for an update/report on dinner! We have a few baseball games this week (the last regular season game of the 2017 season on Sunday and the American League Wild Card game on Tuesday). 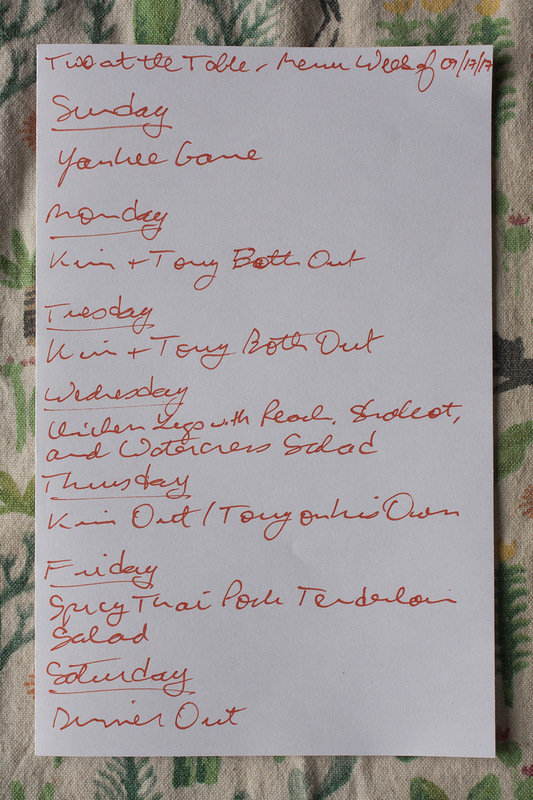 Kim will be out Wednesday and Thursday and we are planning dinner with friends on Saturday. So, we won’t be doing a ton of cooking this week, but as always, we don’t think that’s a good enough excuse not to try a few new recipes. We tried to make The New York Times’ Spicy Thai Pork Tenderloin Salad last week, but when it came time to make it, we found that we didn’t have any pork! We substituted some chicken legs, which worked out really well. The salad is so good, and the dressing so flavorful, that we think it will work with a wide range of meat and fish, like chicken, pork, beef, shrimp, salmon, and tuna. We have a lot of salad left over and some dressing as well, so we’re going to try the recipe again on Monday night, this time with pork tenderloin as intended. On Wednesday and Thursday evenings, Tony will continue the Asian cooking theme. He’ll make the New York Times’ Thai Peanut Chicken Wings, which should be great food to eat during the ballgame he will no doubt be watching on TV. He’ll also make Food & Wine’s Bok Choy with Garlic as a side, so he can honestly say he had a vegetable. (Plus, it will allow him to use up the giant head of bok choy he bought be accident last week, when he forgot we had already ordered some from Fresh Direct!) Tony might dive into our trove of recipes (2200 and counting!) and see if he can find a variation on the wing and bok choy recipes, but for the time being, he’s content to enjoy this dinner twice. We cleaned out the freezer this weekend and found some compound butter left over from when we made The New York Times Skirt Steak with Shallot Thyme Butter, so we tried to find a recipe that would let us use that. We think we have a winner in Fine Cooking’s Skirt Steak with Mushrooms and Shallots. We’ll make it on Friday along with Fine Cooking’s Roasted Broccoli with Lemon as a side. 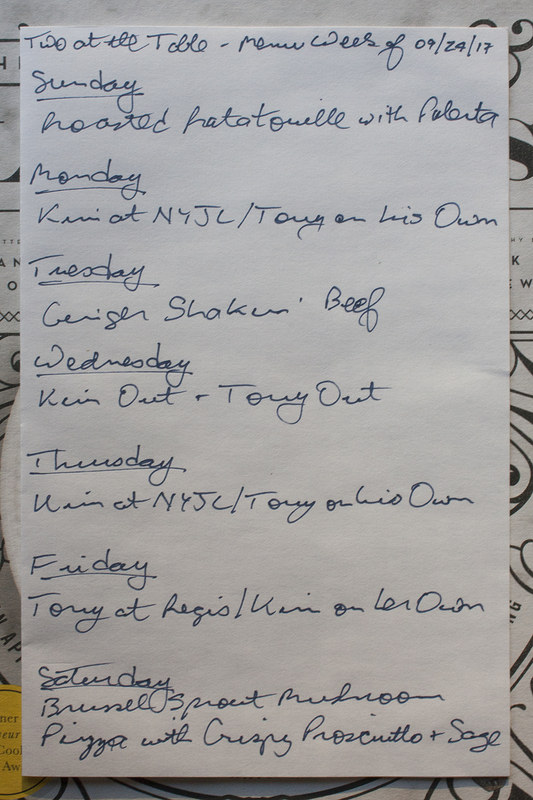 We have another busy week ahead of us, with several nights where one or both of us will be out, but we will still make three new recipes. We’ll try the first of these new recipes on Sunday night when we make Ina Garten’s Roasted Ratatouille with Polenta. With the summer winding down, we thought this would be a good choice. As the name of the recipe makes clear, this dish features a unique way to prepare the vegetables that will go into the ratatouille: roasting them, rather than sautéing them. We’ve made ratatouille several times before, but have almost always had it with fish, so we’re excited to try it with polenta. 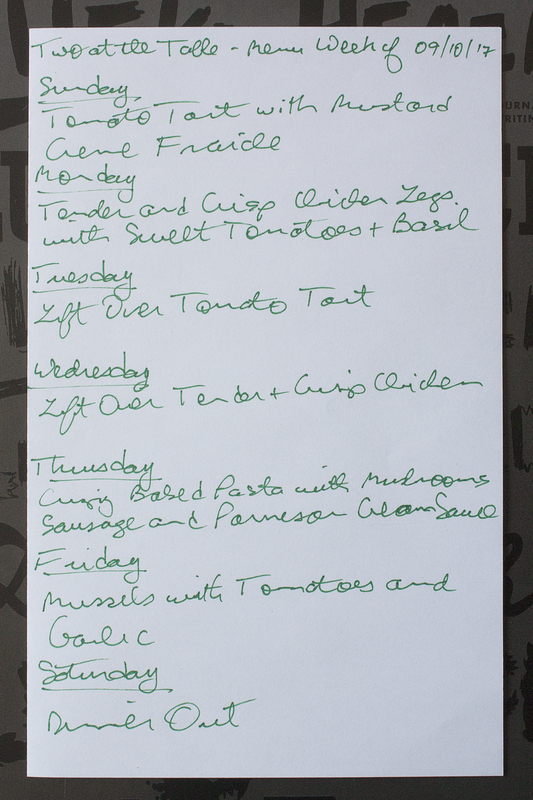 We really enjoyed the Jamie Oliver dish we made two weeks ago, Tender & Crisp Chicken Legs with Sweet Tomatoes & Basil. It was easy and delicious and perhaps best of all, made the apartment smell fantastic for the rest of the night! We’ll try another one of his recipes on Tuesday night, when we make Jamie Oliver’s Ginger Shakin’ Beef. We are going to make one major change to the recipe, however. The recipe calls for using miso paste as a coating for the steak. Rather than buy a container of miso just to have it sit in the fridge, we tried to find an alternative. We found an idea on the Food 52 website, which suggests using a combination of anchovy paste and tahini (both of which we already have) instead of miso paste. We’ll keep our fingers crossed and see how it goes. Kim found a fun pizza recipe and since we already have some dough in the freezer, we thought we would give it a try on Saturday night. It’s Half Baked Harvest Brussels Sprout Mushroom Pizza with Crispy Prosciutto and Sage. It’s not a very traditional pizza, but we know all the toppings, including the apple butter, burrata cheese, and provolone that aren’t mentioned in the recipe name, will go great together, We can’t imagine that putting them on a pizza will make them worse. We will definitely pay a visit to our friend Michael at Columbus Wine and Spirits to see how creative he can get with a wine pairing! 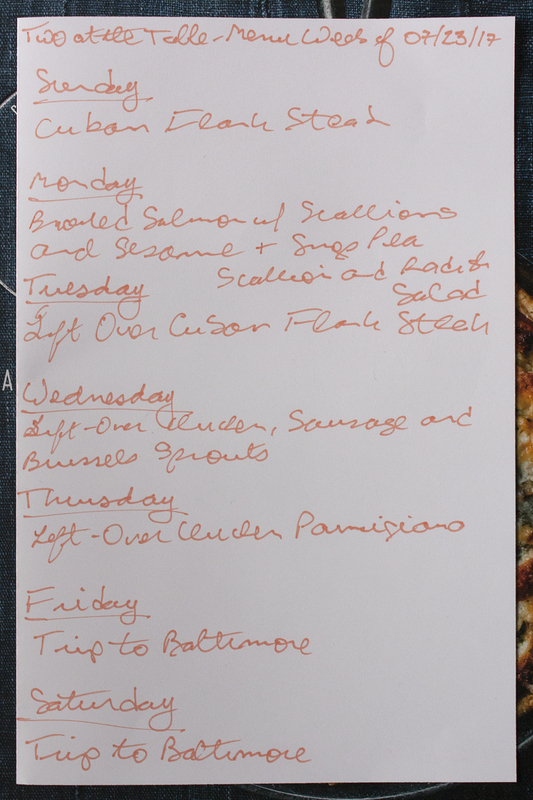 We’ll only be making two dinners at home this week — we both have plans on multiple nights — so we thought we would throw in a breakfast recipe and a lunch recipe to round the post out a bit. 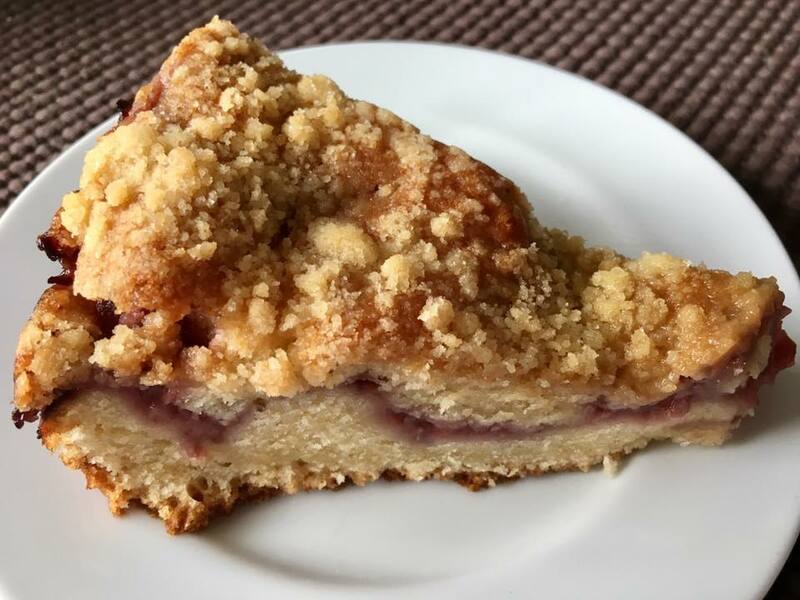 Our “breakfast” recipe is the The New York Times Strawberry Sour Cream Streusel Cake. (We say “breakfast” simply because when it’s around, we’ll (this means Tony) often have it for breakfast with some fresh fruit on the side. We’ve never actually made it “for breakfast,” but instead have taken it to Tony’s mom Maria’s house as dessert when she’s made dinner for us.) This was only the second time Kim made this cake, but she’s already mastered it. It was moist and fruity and not too sweet and, as the photo below shows, very pretty. We took it to Tony’s mom’s house yesterday. Tony’s sister’s godmother, Flora, was visiting Tony’s mom and waited for us to arrive, so we all had a small piece with afternoon espresso. We also had some after dinner and left some behind for Maria and one of Maria’s neighbors. We’ll be at the Yankee game Sunday afternoon and typically don’t have a big dinner after games. 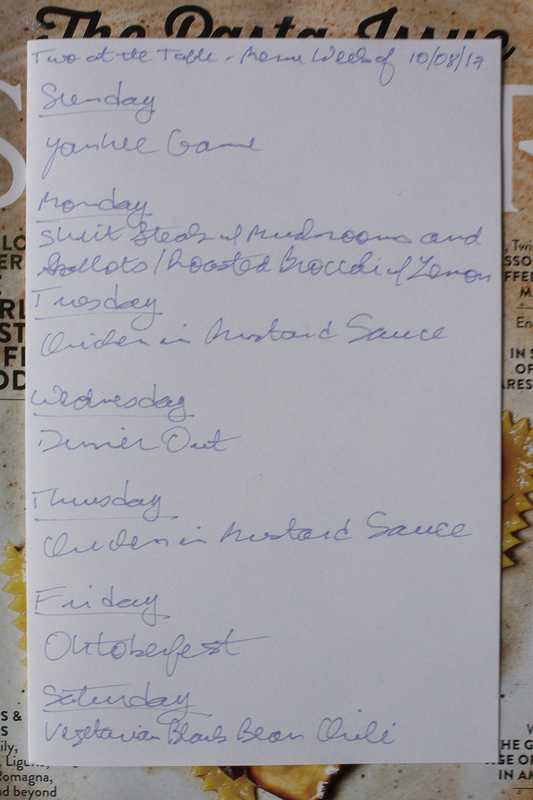 We also both have plans Monday and Tuesday evening, so we won’t make dinner until Wednesday. Since we won’t be able to have fresh peaches for much longer, we decided to try Real Simple’s Chicken Legs with Peach, Shallot, and Watercress Salad. This easy recipe promises to be delicious, plus, it will make leftovers! Sadly, we won’t be able to use any peaches from Tony’s dad’s peach tree — they were all stolen! Tony and his brother are working on some advanced security measures (like, um, a padlock) to prevent this from happening again next year. Kim also found a fun lunch recipe that we’re going to try this week. It’s for Spinach Hummus Lunch Wraps, a recipe Kim read on the Love and Lemons blog. Kim has an excellent hummus recipe that has become her go-to, but we thought we would mix things up a bit and try this version, which incorporates spinach into the mix. It should make for some fun lunches and a nice change of pace. Last but not least is Friday night’s dinner, when we’ll make The New York Times’ Spicy Thai Pork Tenderloin Salad. We’re big fans of pork tenderloin because it cooks so quickly, so we’re always on the lookout for new recipes . We’ve never made this version before and we’re looking forward to it. Tony is already trying to figure out how to convert the leftovers into some type of banh mi sandwich for a weekend lunch! The New York Times’ Skirt Steak with Shallot Thyme Butter: This was a very quick, very simple recipe. It only takes about 10 minutes to make the thyme/chive/shallot butter and, if you like your steak very rare like we do, just a few minutes more to cook the skirt steak. The New York Times’ Grilled Chicken Breasts with Spicy Cucumbers: We found this recipe in an article in The New York Times titled “A Quick, Satisfying Fix for Weeknight Chicken”. As a rule, we never make boneless, skinless chicken breasts, because cooking them to the right temperature often means overcooking them in general. We also almost never cook chicken of any kind on our grill pan, because it takes a long time and tends to make the apartment a little smoky. This recipe solves both problems by directing you to pound the chicken breasts flat to speed up cooking (we pounded them down to about a quarter of an inch thick, so they only took about 2 or 3 minutes per side to cook) and to marinate them to make sure they don’t dry out. It’s the kind of simple cooking trick that we should have been able to figure out on our own, but articles like this are part of any we love the Times’ Food section so much. We should add that the sauce for the cucumbers was delicious — and pretty spicy! Food & Wine’s Charred Vegetable Salad with Halloumi: This recipe caught our eye not so much because it featured charred vegetables or even halloumi (though this ingredient, a semi-firm Greek cheese a little like mozzarella, was pretty intriguing), but because it includes fresh figs. It made for a nice, relatively light dinner. Food Network’s Lemon-Thyme Chicken with Heirloom Tomato Salad: We made this recipe both because it features heirloom tomatoes, which are at their peak at this time of year, and to test the “pound and brine” method mentioned above. The method, not surprisingly, worked well with this recipe too and has become our go to approach for making chicken this summer. The Homesick Texan’s Nachos and Ina Garten’s Gazpacho with Grilled Shrimp: This was a dinner we threw together on our own. We found ourselves with a lot of jalapeños when we over ordered for the spicy cucumber recipe, but fortunately, Tony found a recipe that solved the problem: Gimme Delicious Food’s Quick 10 Minute Pickled Jalapeños. After only a few minutes of work, we had a jar of delicious picked jalapeños. (Tony was on a pickling kick that day and also made a batch of dill pickle spears as well as Tasting Table’s Pickled Asparagus, which may very well be the most delicious pickled thing Tony has ever made.) The pickled jalapeños made Kim think of the Homesick Texan’s nachos, which, in true Texas fashion, consist of one tortilla chip, with a square of melted cheddar, and a pickled jalapeño on top. Kim also made a big batch of gazpacho, which is perfect for summer, and some simple grilled shrimp to round out a fun, tasty dinner. Real Simple’s Spicy Steamed Mussels: Kim is obsessed with mussels and Tony is obsessed with finding new recipes so he can make mussels for her; these two obsessions came together quite nicely last Saturday night. This very simple dish, which we ate with toasted bread, was a perfect summer dinner that took very little time to make. 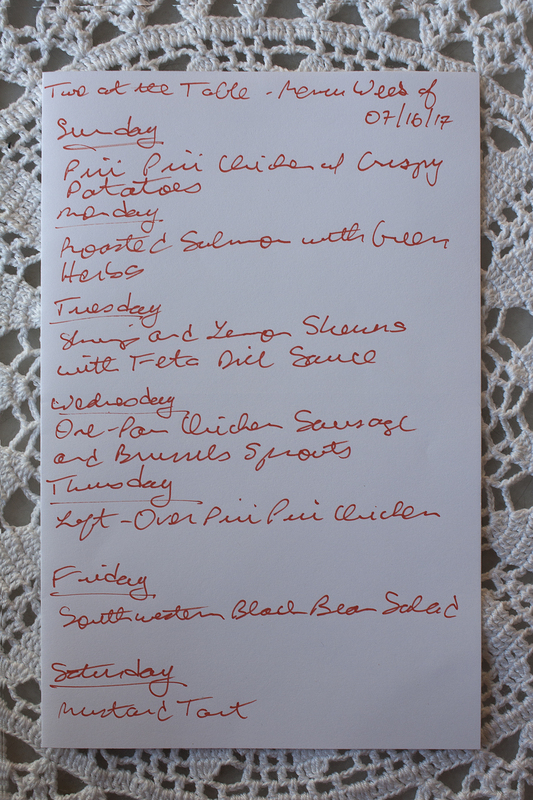 We have a somewhat busy week this week, so we’re only making four dinners. The theme for the week is experimentation, both in terms of the recipes we picked (all four are new for us and all sound delicious) and for at least two of them, how we will make them. We’ll kick off the week on Sunday with Real Simple’s Tomato Tart with Mustard Crème Fraiche. This dish uses pre-made puff pastry, so it comes together quickly. It’s a lighter dinner, which is perfect as Tony has a Sunday afternoon of football, beer, and bar snacks ahead of him, and should make enough for leftovers on Tuesday. On Monday night, we’ll make Jamie Oliver’s Tender & Crisp Chicken Legs with Sweet Tomatoes & Basil. With the weather starting to get chilly in New York City (we had more days below 80 degrees than above 90 degrees this past August, which is very unusual) and predicted lows below 70 degrees every day this week, this sounded like the perfect comfort food. We’ll have the chicken again on Wednesday. Tony will be on his own on Thursday and decided to make pasta, specifically, Serious Eats’ Crispy Baked Pasta With Mushrooms, Sausage, and Parmesan Cream Sauce. He wants to try the recipe to see how it tastes, but is mostly making it so he can use our cast iron skillet and test Serious Eats’ technique of cooking pasta in a minimal amount of water. One of the main reasons we don’t make much pasta is because it can get a little messy; we’re hoping this technique works well enough to become our go to approach. We’ll have dinner with Tony’s mom on Saturday night, but we’ll make mussels again on Friday night. (After all, we haven’t had them in almost two weeks!) This time, we’ll try Delish’s Mussels with Tomatoes and Garlic. This dish will also be an experiment, not only because we’ve never tried this recipe before, but also because we’re going to buy our mussels at a local fish market instead of going to our nearby Whole Foods or ordering from Fresh Direct. We figured with the amount of seafood we make, it made sense to find one more option for buying it. We have another busy week this week, with lots of evening plans, plus a trip to Baltimore over the weekend for Kim’s uncle’s 60th birthday. Nevertheless, we’re trying a couple of new, simple recipes, which we think we’ll really enjoy. The first new recipe is Food & Wine’s Cuban Flank Steak, which we’ll have on Sunday. This recipe features a simple marinade, made with lime and orange juice, as well as cumin and fresh oregano, plus a few other ingredients. The steak is served with mangoes, which is a fruit we don’t eat often and have cooked with hardly ever, if at all. We’re looking forward to the new experience! We’ll have seafood on Monday night, in the form of Bon Appetit’s Broiled Salmon with Scallions and Sesame. Kim picked out a fun side salad to serve with the salmon: Ellie Krieger’s Snow Pea, Scallion, and Radish Salad. It’s a bit rare for us to make two recipes for the same meal during the week, but the salmon really called out to be paired with something interesting and this salad will fit the bill! We’re really excited about our trip to Baltimore. Not only will we get to see Kim’s uncle and his lovely girlfriend, plus Kim’s mom and dad, we’ll also get to try some great restaurants. On Friday night, we’ll have dinner at The Severn Inn, a cool waterfront restaurant just outside of Baltimore. On Saturday afternoon/evening, we’ll celebrate Kim’s uncle’s birthday at the Two Rivers Steak & Fish House. Crabs feature prominently on both menus, in the form of crab salads and crab cakes, not to mention soft shell crabs, so we’ll enjoying having something we don’t get very often in New York City.